I have an 84ish Kramer Pacer Imperial (C7 on the neck plate) . I am trying to learn what I can about it. Some info seems contradictory so correct me where I am wrong. It is a tilt back hockeystick headstock with a thick fingerboard so I was told that would be ESP. Make sense? I am also "worried" about the scarf joint. I know they are an issue. How do I identify if it is going to be a problem? I can feel the joint when I run my fingers over it but the finish has been sanded off the neck a long time ago. 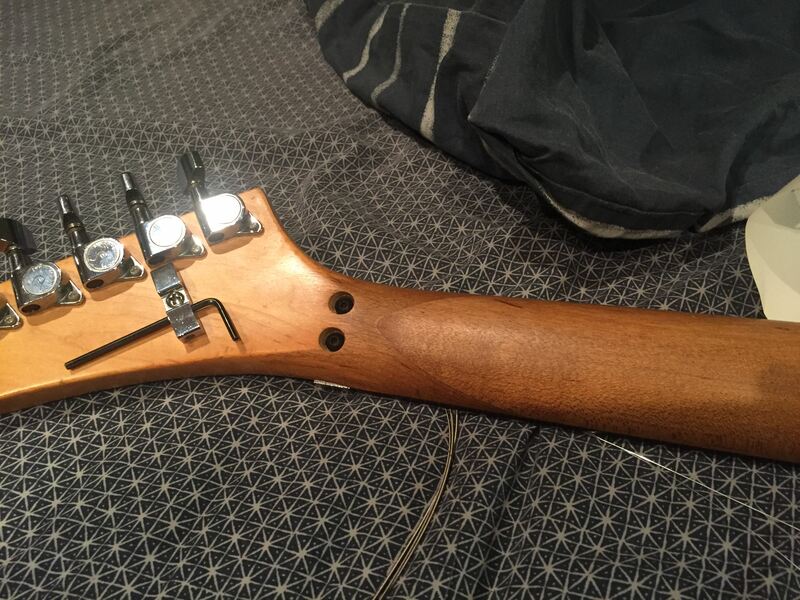 Is there any hints to know if the neck joint is going south? The body would have been made by Sports? It is maple, HEAVY (10.25lbs with the neck/hardware included) and has a very thick finish. Assuming the guitar is mostly original (at least one pot replaced, and the nut locks as well) anything else I should know about her? I bought it for about 350US but needs a refret (8$). The FR took some diddling but I got it working. The guitar was sold with working pickups but the wiring was a clu-fu but that was just putting back the wires in the right place and fixing cold solder joints. My first post here so let me know if I am doing anything wrong/inappropriate. Most likely Sports or LaSido. can’t see pics. Go to imgbb.com, create an acct & paste some links. If you quote the post, you can see the links to the pics and open those in a new window. I got them corrected below. Sometimes the scarf joint slips making the head stock kick back slightly, basically making a high spot around 2nd fret. This is usually visible looking down the edge of the neck. A fret dress may fix this so have a look at your frets and if 2nd fret looks lower than the rest this has happened. If it's bad it'll need taking apart and re-gluing. If it was going to separate completely it probably would have done so by now. _xxx_ wrote: If you quote the post, you can see the links to the pics and open those in a new window. I got them corrected below. Thanks! It was my first post so I just figured the preview doesnt show the pics. Next time I will know. Next easy question: All pots are 500k audio and caps are .022uF .. sound right?